Up here in the hills – unless you’re living on the eastern side of Dahlonega, or down in one of those picturesque, lush farming valleys heading out Hwy 52 towards Elijay – you don’t have a lot of options for gardening or growing anything….. except rocks. A result of the clear cut logging in the Appalachians back in the 30’s has left most of the surrounding areas completely devoid of any really usable topsoil. Our property isn’t any different. 99.999% of our land is scrub forest and DR (Decomposed Rock), dispersed with intermittent layers of that good ol’ sticky Georgia Red Clay. …. needless to say, gardening is a challenge. Last year, we attempted to container garden. It was lackluster at best. Even with drip lines and composted manure, the containers were just no match for the hot summer heat, and the diminutive bounty was the proof. This year, we’ve decided to try something new – Hay Bales. I saw somewhere on the ever-net where a guy in the mid-west was selling classes to teach you how to hay-bale garden – and, was apparently getting $35.00 a head for the class. (More power to him). I, on the other hand, am just about as cheap as you can get, and I can’t see paying anyone to show me how to do something if I can figure it out myself. So I did a little more research, and here is the recipe for a hay bale garden. Wheat Straw Bales – Use the following as a guide on the number of bales you will need. Reduce the amount of nitrate to 1/4 cup – continue to soak the fertilizer into the straw. Transplant your plants into the bales. I used a spatula to make a crack in the bale for each plant. Place the plant down to its first leaf and close the crack back together as best you can. 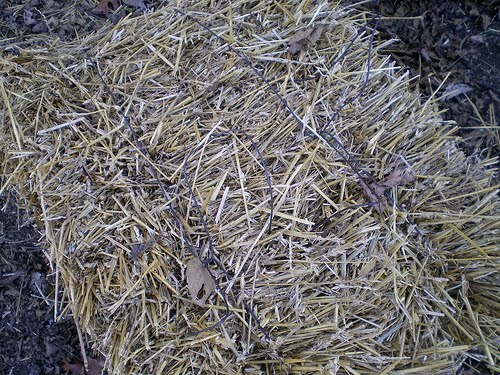 With the compost, add about a 2″ layer of medium into the top of the bale and press it down a bit. What a fascinating way to garden. The soil out at the cottage is way to acidic to grow a garden. I love it!